Our dogs and cats are always going places! 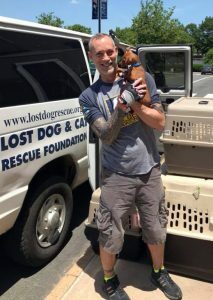 On the weekends we load up our dogs and cats at the Lost Dog Ranch in Sumerduck, VA, and our pop-up kennel in Falls Church, VA, and send them to adoption events all over the DC Metro area. During the week, our dogs and cats have vet visits and sometimes they need a ride from a nearby shelter, or even from the airport. We need drivers who are willing to chauffeur our furry friends to their futures. For adoption events and some vet visits, drivers use the Lost Dog van. For shelter and airport pickups or transportation to foster homes, drivers use their own car. To learn more about helping out dogs and cats go places, email volunteer@lostdogrescue.org. Also, make sure to like our Lost Dog Volunteer Facebook Page, where we post emergency driver needs and other opportunities.